We provide yoga and fitness classes seven days a week that assist our members in the pursuit of a healthy and active lifestyle. 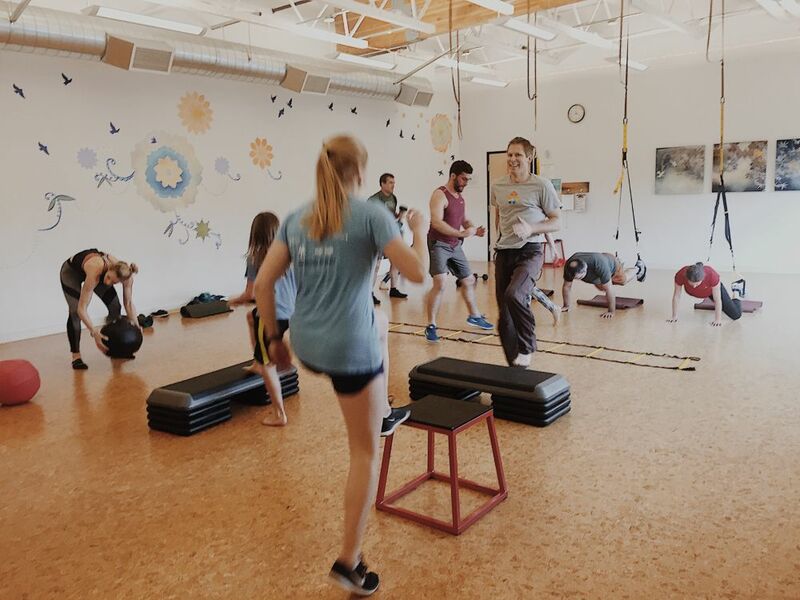 Our Studio Team has developed a multi-directional approach for a successful Yoga and Fitness Program, including: group classes, one on one instruction, workshops, and community events. It is our hope that we can empower each student to find their own limits and the style of practice that will fit their individual needs and lifestyle. Our classes are specifically designed to motivate and encourage all who enter our studio. We strive for our personal best in each practice and workout. All of our studio classes are included for FREE with our regular gym day passes, memberships, and member guest passes. Vinyasa is the dynamic link between breath and movement. Cultivate strength and flexibility while building heat and body awareness. Expect a challenging, alignment based practice composed of a full body warm up, standing poses, twisting, core stabilization, heart openers, optional inversions and end with Savasana. This slow, quiet and warm class is all about relaxing into your body and mind. In Restorative Yoga, you will hold gentle poses for extended periods of time. Restorative Yoga allows you to work with the breath and create more space in the body. Expect physical comfort; use of a lot of props; seated, supine, and prone postures. Yin Yoga is a slow paced practice that targets deep connective tissue in the body. Postures are held for longer periods of time, from 1 to 4 minutes, in order to facilitate gradual opening and mobilization of the joints. Our instructors put specific emphasis on breath work and environmental cues in order to promote stillness and calming of the mind. Expect mild discomfort; deep opening of the spine, shoulders, hips and pelvis; and space for meditation throughout the practice. Cultivate strength and flexibility while building body awareness. This class begins with gentle body opening postures and slowly builds into a vinyasa flow. About halfway through class, you will begin to slow things down as you move into a restorative practice. Think of the perfect fusion of vinyasa yoga and restorative yoga. Expect a perfect combination of Vinyasa + Restorative. All yoga classes on this schedule are great for climbers, however in this class, you will specifically target areas of the body overworked on the wall. Expect some joint work, hip openers, balance work, shoulder and chest work, mindful movement. A workout suited for all! In Bodyblast we get the heart pumping, work on building muscle, and get fit! An energetic, total body workout in each and every class with circuits designed to work your whole body, along with a cardio and core blast. The perfect workout to get your sweat on! All levels and abilities welcome. It’s so much more than core! With circuits designed to increase your cardiovascular endurance and engage your core, this high energy class delivers a complete conditioning and core workout! All levels and abilities welcome. Metabolic Conditioning is the key to endurance, better athletic performance and a lean, healthy body. In this advanced, circuit style class, we will maximize our time with high intensity interval training, using cardio bursts and compound resistance exercises. In our Mat Pilates Class we focus on balancing the spine with healthy lumbopelvic biomechanics and firing up the deep stabilizers and glutes. We will spend time lengthening as much as strengthening. Take the spinal twists out and get back to neutral with this smart approach to a classic method.